Before we present our argument for this case, let's be clear and clarify that we don't think it's acceptable to eat smelly food on public transport and we always advocate people take their litter with them. Nobody wants to sit in an Underground carriage that reeks of doner kebab or take a seat on the bus only to find a pile of chicken bones at our feet — it's happened to us... on more than one occasion. But what if we're eating a humble sandwich or a piece of fruit, is there something wrong with that? Many people would still object but here's why we think the stigma needs to go. London is one of the world's busiest cities and most Londoners have learnt to optimise their commute time, whether it be reading a book, working on laptops, playing games, listening to music or watching some catch-up television. Considering that it's now pretty much accepted that women, and the occasional man, often do their make-up on the way to work, surely grabbing a quick bite is not a stretch. When we've been munching a sarnie it's often because we're grabbing some sustenance as we rush between meetings or are on our way to an evening event where there won't be any food. Yet we've had fellow commuters staring daggers at us. One common aversion we all share is that nobody wants to watch someone else eat, and sitting opposite someone means we're forced to watch them masticating away. But we commuters have spent years perfecting the best way to avoid eye contact with each other and have plenty of digital devices or a book to avert our gazes to. We don't really see this as major issue. Now some of you may be thinking: why don't you just eat where you bought the sandwich, it only takes 10 minutes and surely your life isn't that hectic. This is a fair point, but supermarkets don't have anywhere to sit and most of London's sandwich shops have all their seats taken as well. London is replete with public benches and green spaces, but this is only workable in the summer — sitting outside in the rain and wind of November isn't really practicable. 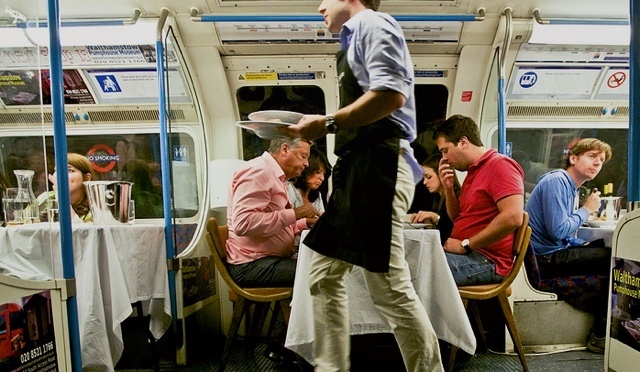 The times we've been eating on public transport haven't been because we want to, it's because our hand has been forced by the chaotic nature of our day. So next time you see a fellow commuter munching away on a Sainsbury's sarnie, rather than staring at them angrily have a bit of sympathy and recognise they don't want to be in this situation either. But if they're eating smelly food feel free to give them plenty of evils — but don't speak up, that wouldn't be very British. For other articles on what's socially acceptable, see our guide to umbrella etiquette.